Sushi and rolls are favorite dishes of many devotees across the globe. This dish is popular both in Asian and European countries, although initially it was absolutely different from what it is now. Sushi were first mentioned in China in the 2nd century A.D. They have appeared thanks to the way people used to preserve food: fish was put in rice to ferment, and this allowed to keep the fish good to eat for a certain period of time. The rice was then thrown away and fish was consumed. In the early 19th century there was a man named Hanaya Yohei who decided not to wrap fish in rice but place a piece of fish on top of a long-drawn piece of seasoned rice. This style was called nigiri sushi and this was an absolutely new way of eating fish. 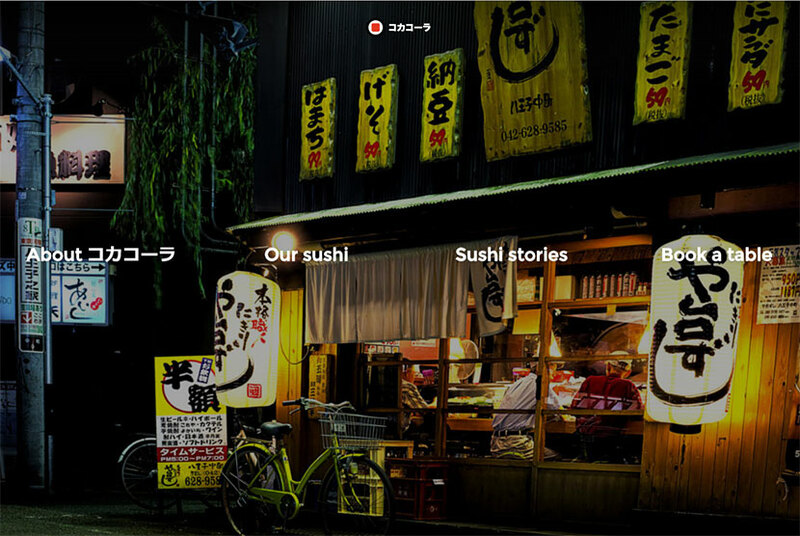 Our today’s collection includes everything concerning sushi, and these are WordPress themes for sushi bars and restaurants, business cards, Asian food menus, and much more. So enjoy! 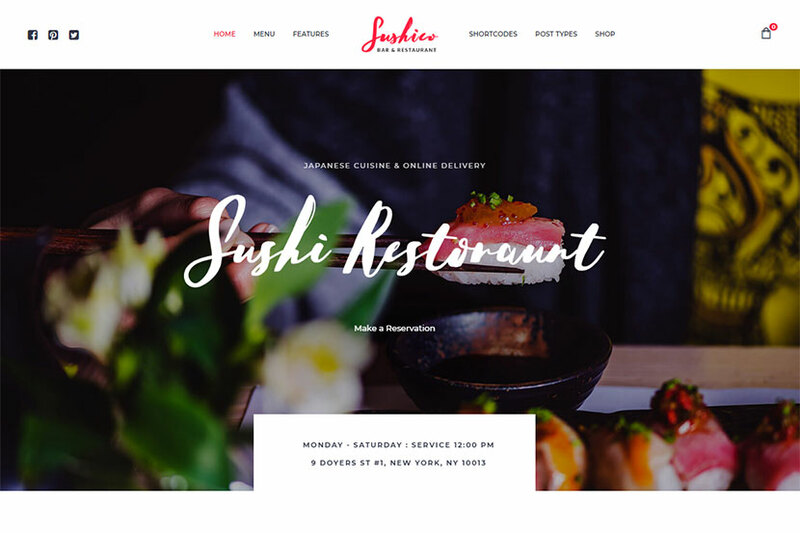 This is a modern and creative WordPess theme suitable for restaurants, sushi bars, Japanese and Chinese food, wok dishes, Asian cuisine restaurants, and more related establishments. 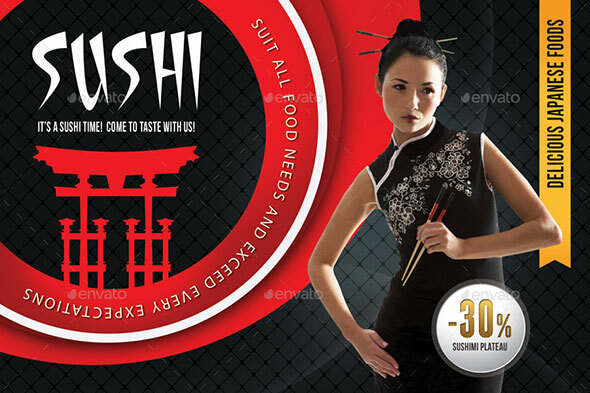 It comes with 3 homepage layouts for sushi, Chinese and Thai food. Multiple features of the theme include Layer and Revolution Sliders, custom form builder tool, custom admin panel with a number of options, 99+ custom shotcodes, unlimited menu colors, different page backgrounds, multiple widgets, and many more advantages. 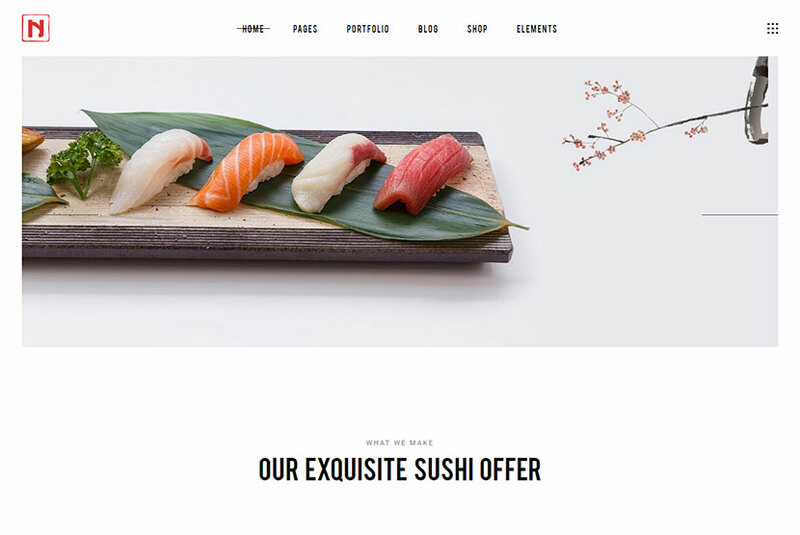 This WordPress template is going to suit for sushi restaurant, sea food, sushi bar, or any other café or catering business. You can change the color scheme and structure of the pre-made theme’s pages to create your own website. The theme comes with powerful admin panel, catalogue mode, Event Calendar, premium slider plugins, WooCommerce support, WPML compatibility for translation-ready website, 4 unique menu designs, Contact Form 7, MailChimp integration, 9 blog pages, and many more features. A seafood and sushi oriented WordPress theme which can become a full-fledged restaurant website serving as a cool presentation of your public catering business. It comes with 6 homepage layouts designed in different styles and structure. The template comes integrated with WPBakery page builder, Revolution Slider, powerful admin panel, multiple shortcodes, pagination types, widgets and filters, a number of portfolio layouts, various blog styles, 5 header types, video backgrounds, boxed layout options, and many more features. 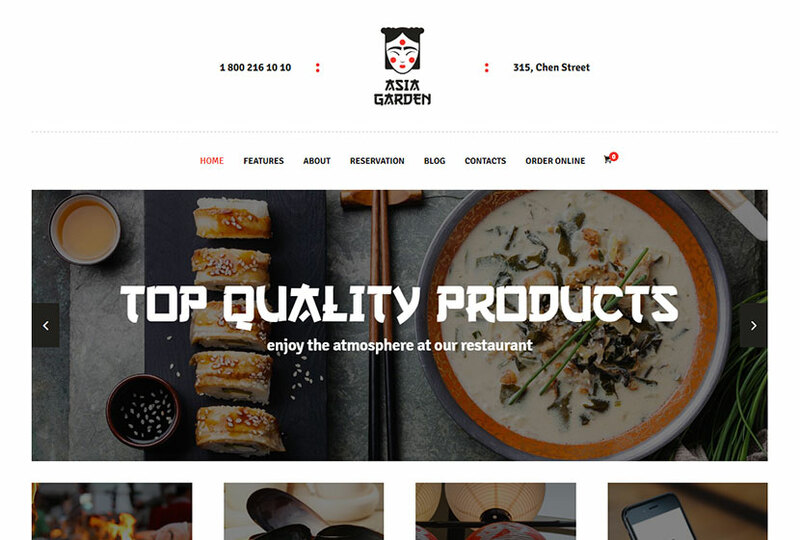 One more cool WordPress theme is designed to become an Asian food restaurant website, seafood, exotic meal company site, Japanese and Chinese dishes recipes website, roll and sushi bar, Eastern cuisine restaurant, and more related public catering businesses. The theme comes with modern and flexible design, Slider Revolution and Swiper Slider included, user and main menus support, boxed and fullwidth layouts, WPBakery page builder integrated, interactive ajax search, multiple blog layouts, 20+ post animations, custom widgets, post types and shortcodes, and much more. 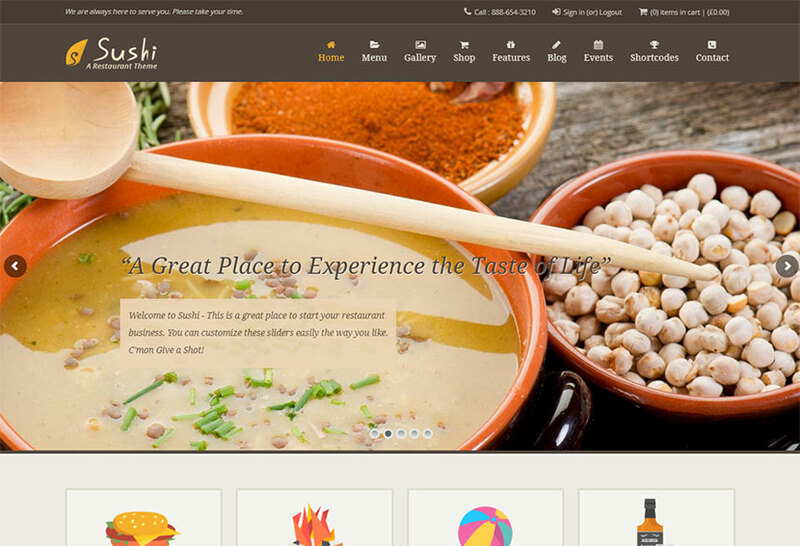 This is a unique WordPress theme which is a multi-concept solution appropriate for sushi bars, burger houses, restaurants, bistros, cafes, and other related establishments. It includes 6 homepage layouts suited for different types of restaurant websites. As the template is fully integrated with WPBakery drag-and-drop page builder, you can easily build structure and content of your pages using the intuitive drag-and-drop interface and without any coding knowledge. Online reservation functionality is available to allow for booking tables right on your website. See more of the theme’s features. A restaurant WordPress theme which will suit for almost any restaurant out there. 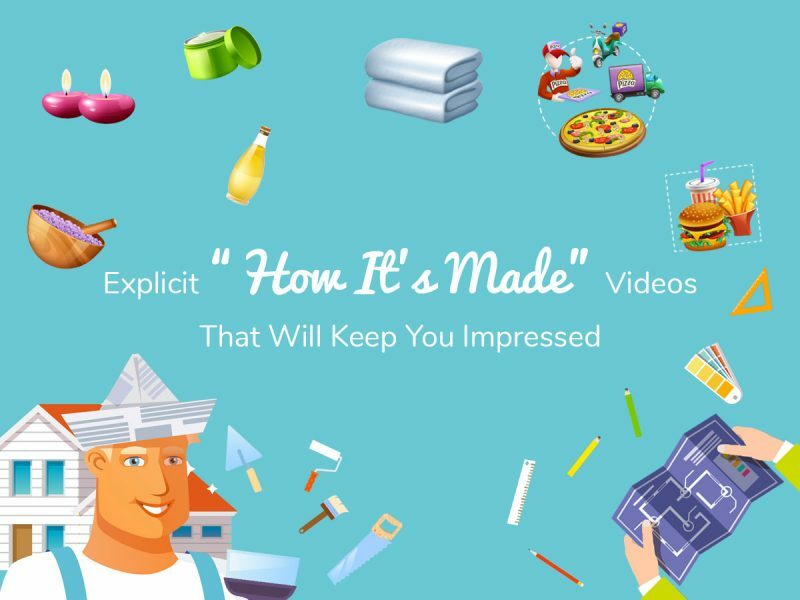 It comes with 6 homepage layouts including Burger, Eiffel, Orient, Grill, Tap and Video. The template comes with a host of useful features helpful for building a professionally looking website. It also includes pre-defined pages like About Us, Blog, Gallery, Contacts, Reservation, and more. 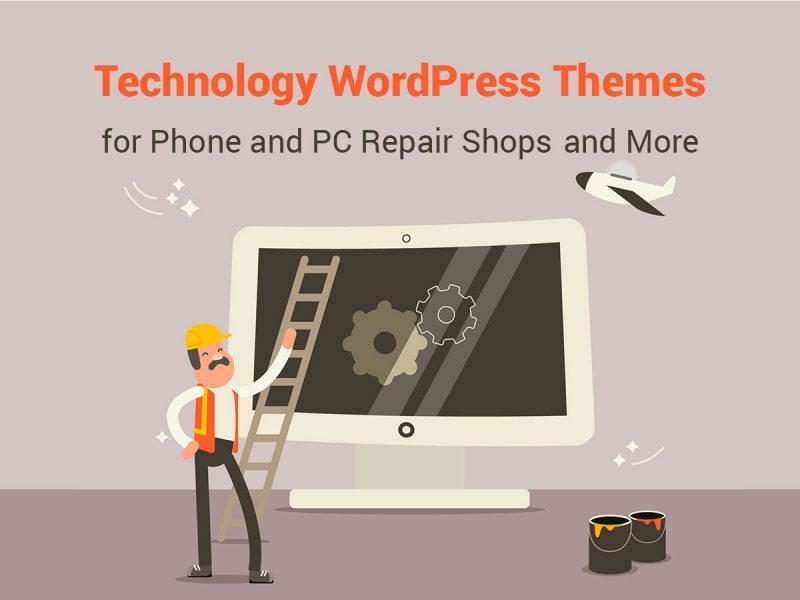 The theme is easy to manage, has beautiful typography, easy-to-use drag-and-drop interface which allows to build a website page after page without any coding. 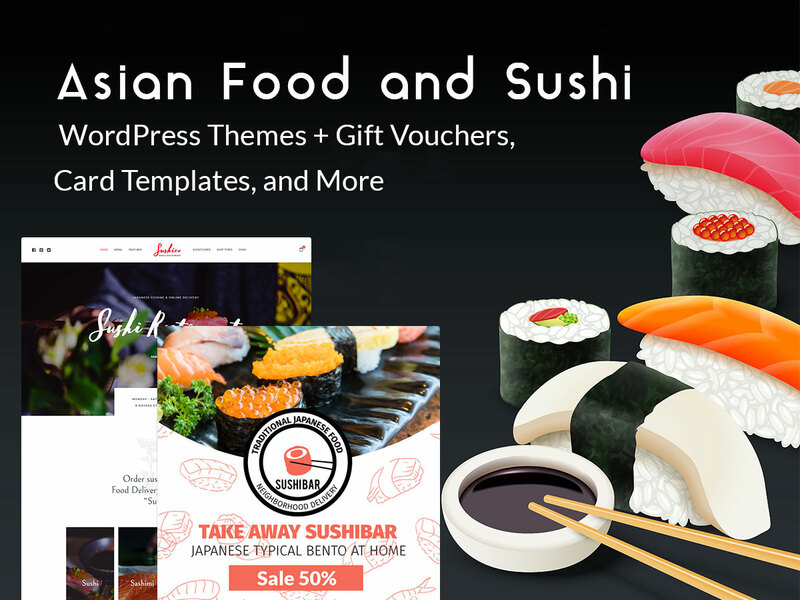 A food and restaurant Shopify theme which you can use for selling food online, building a website for public catering, restaurant, sushi bar, Japanese, Thai or Chinese cuisine café, or other related establishments. Its features include logo upload, heading background, body background change, slider management, custom widgets, MailChimp integration, social sharing, shipping calculator, Google fonts support, easy customization, a unique blog and news page, customer accounts, and much more. A sushi restaurant menu gift voucher template available in 2 PSD files, front and back sides design, CMYK 300 DPI color mode, different print and cut sizes, highly organized layers. 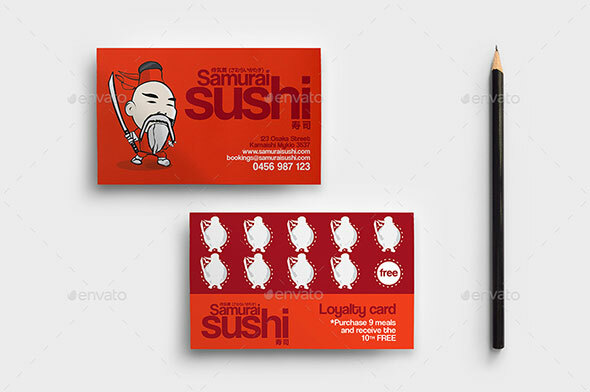 A sushi bar loyalty card template which comes in PSD and Ai format as well as with JPG preview. All is well-organized in layers and folders. A sushi postcard template available in 2 PSD files with 300 DPI CMYK color mode, double side, smart objects and print ready format. 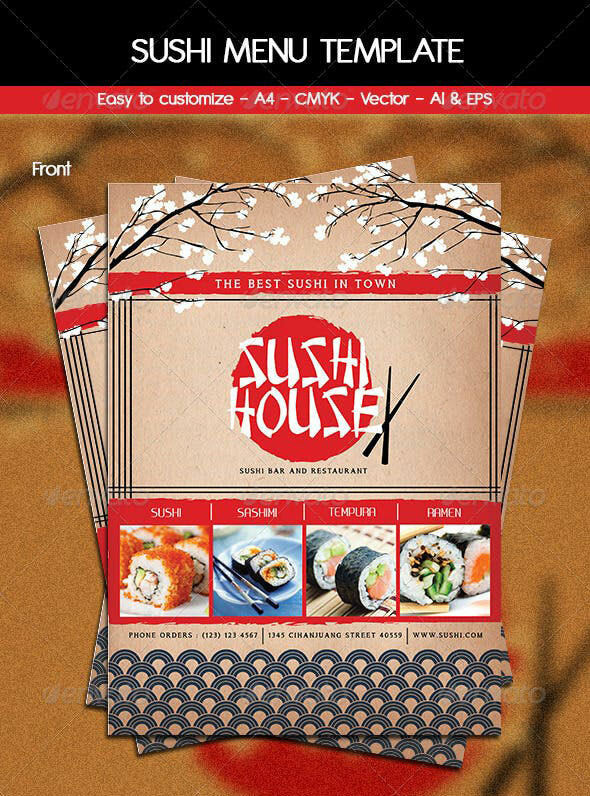 A sushi restaurant menu gift voucher which comes in 2 files with PSD format, highly organized layers, print ready format. 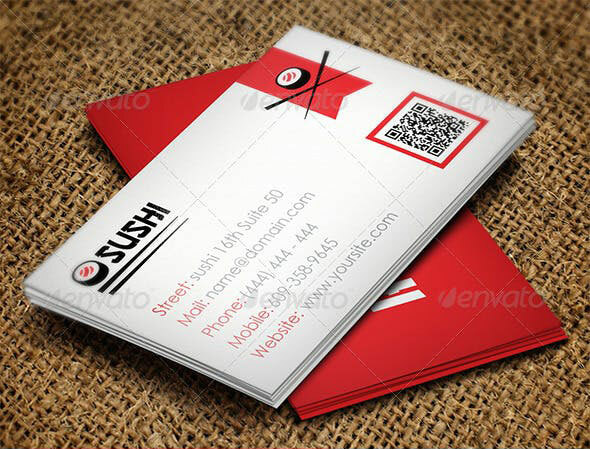 A business card template suitable for sushi bar and available in layered Ai and EPS formats. CMYK print ready color mode. 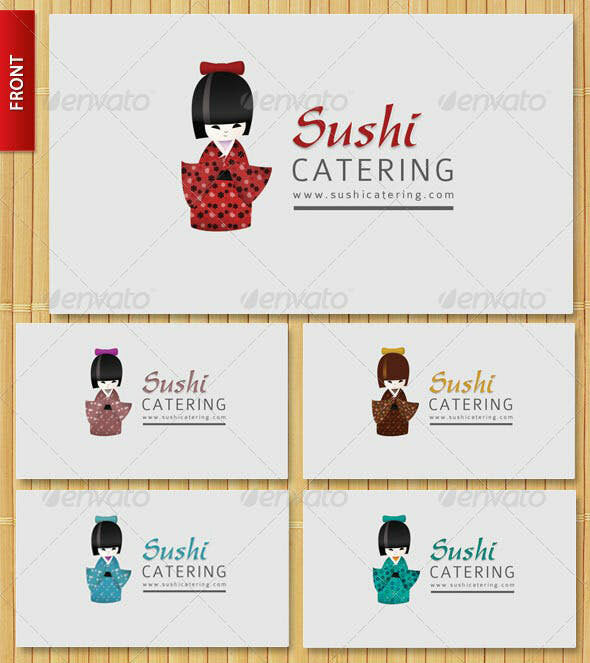 A sushi food business card template which comes in two layered PSD files, all layers are highly organized, the file is print ready, 300 DPI CMYK color mode. 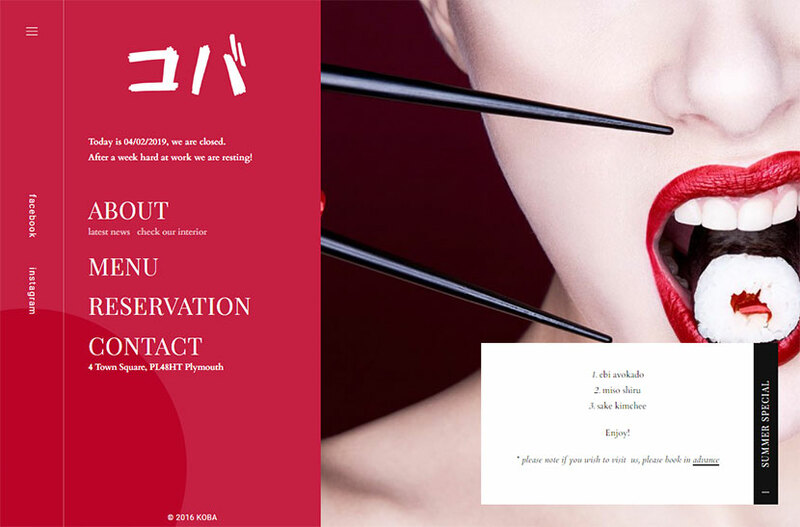 One more cool sushi restaurant business card which is absolutely print ready, comes in 300 DPI CMYK color mode, PSD format. 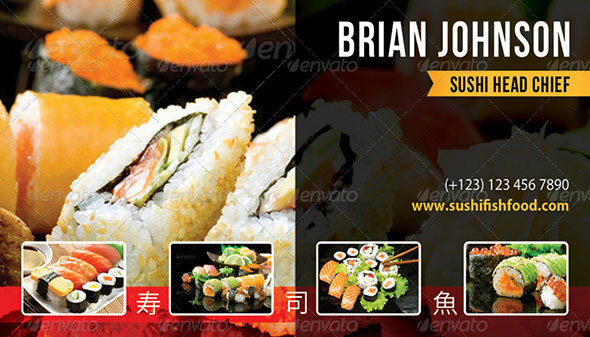 Sushi catering templates which come in PSD format, 300 DPI CMYK color mode. Business card + menu brochure come in the pack. 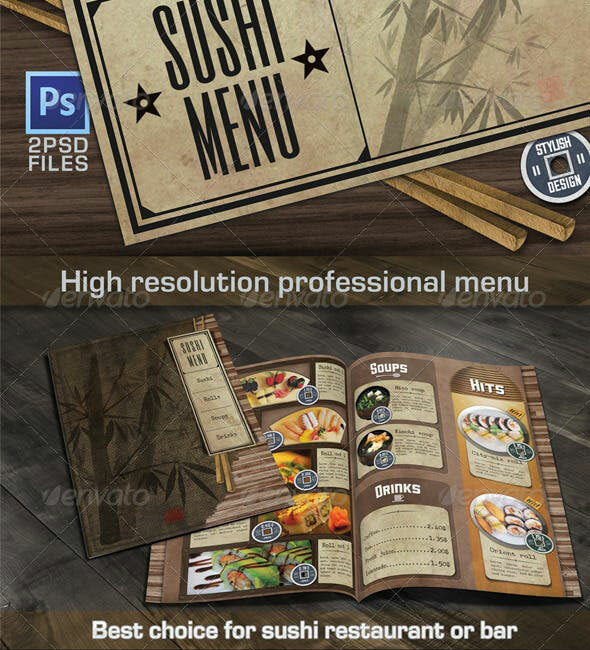 A high resolution professional food menu template which will suit for a sushi restaurant or a bar. All files are organized in folders and are easy to edit, all layers are also fully editable. 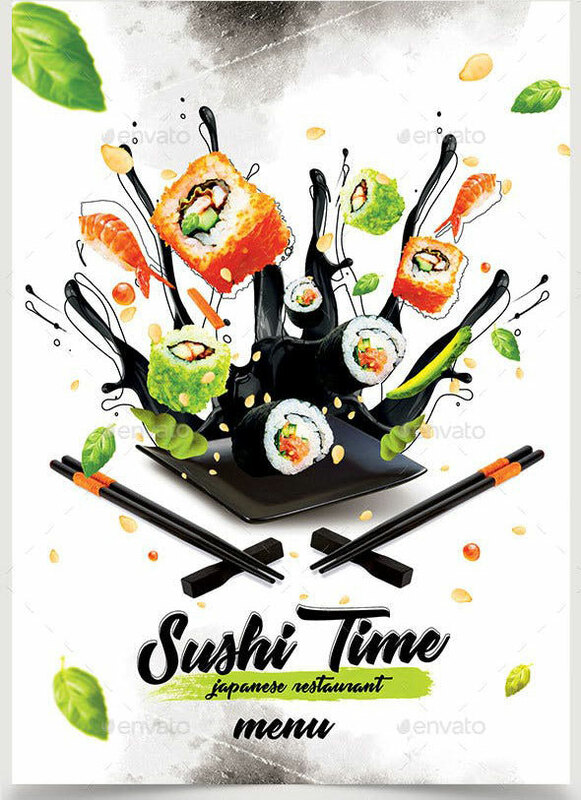 A food template suited for Japanese restaurant and depicting rolls and sushi. 3 layered PSD files are included. Print ready format, CMYK color mode. 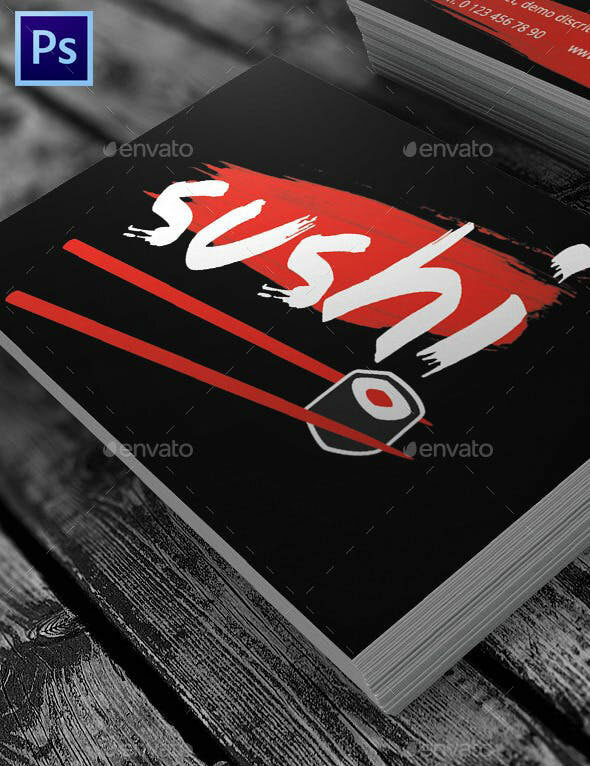 A dark sushi menu template which comes in 2 PSD files with images included in the pack. 300 DPI CMYK color mode, print ready editable format. 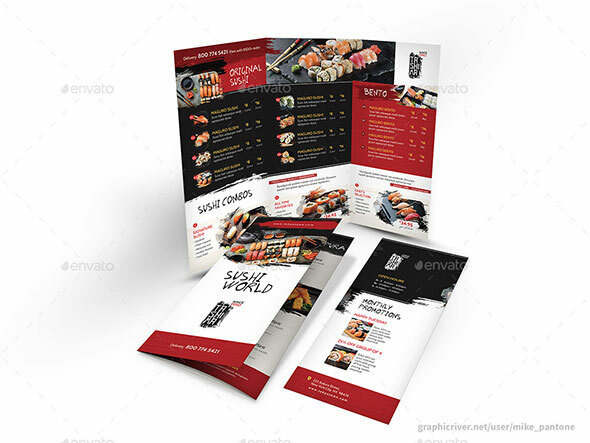 A trifold brochure food menu template for Japanese sushi restaurant. The file comes in PSD, Indd, IDML, Ai and EPS formats. 300 DPI, CMYK color mode, print ready format. 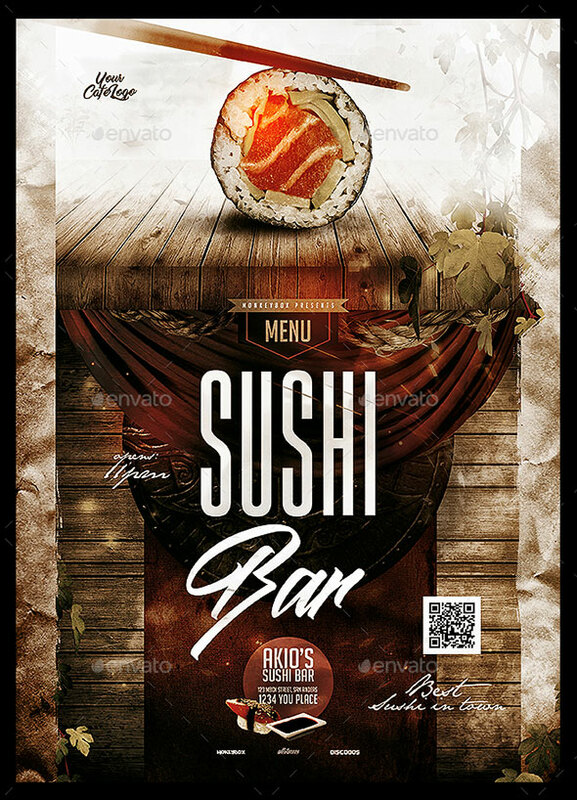 A print ready sushi bar menu coming with editable text, 300 DPI CMYK color mode, PSD A4 format. 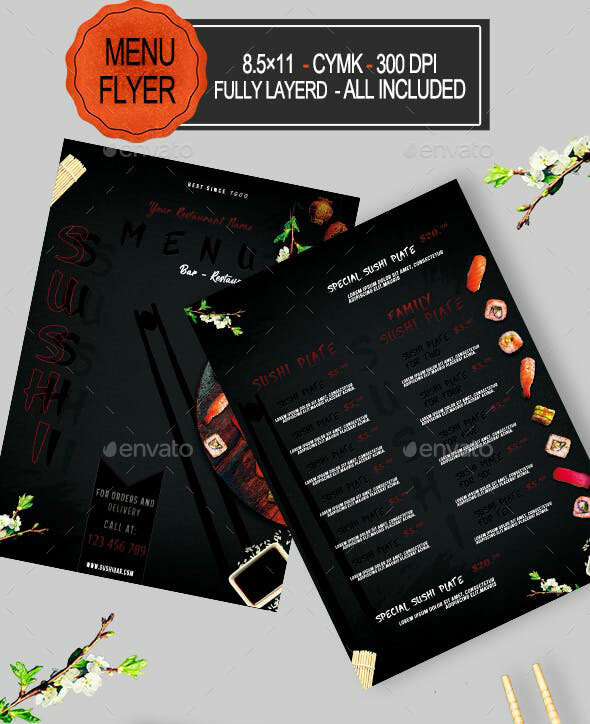 One more sushi menu flyer template coming in editable vector EPS and Ai formats. Two sides – front and back, CMYK color mode. Many more awesome theme and graphics collection are around the corner. Thanks for staying with us.